HÀ NỘI — Hà Nội 1 beat HCM City 2 by a score of 2-0 in the fourth-round match of the National Women’s Football Championship, yesterday in HCM City. Nguyễn Kim Anh scored for Hà Nội just two minutes before the break, while HCM City 2’s Nguyễn Thị Tuyết Mai netted an own goal in the last seconds of the game. The win propelled Hà Nội 1 to top position in the ranking table with 10 points, replacing Phong Phú Hà Nam who enjoyed top spot for only 24 hours. Meanwhile, this was the fourth consecutive defeat for HCM City 2, who are rooted to the bottom of the table with no points. 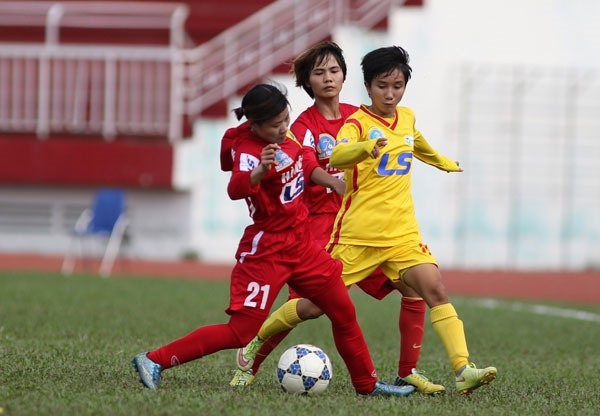 In a later match, Sơn La pocketed their second win of the season by beating Hà Nội 2 by a score of 1-0. Cầm Thị Hằng scored the matches’ only goal in the 87th minute.